Can the modeling tool bar be switched horizontally ? To do this, you need to open the Tool Manager (Workspace>Tool Manager). 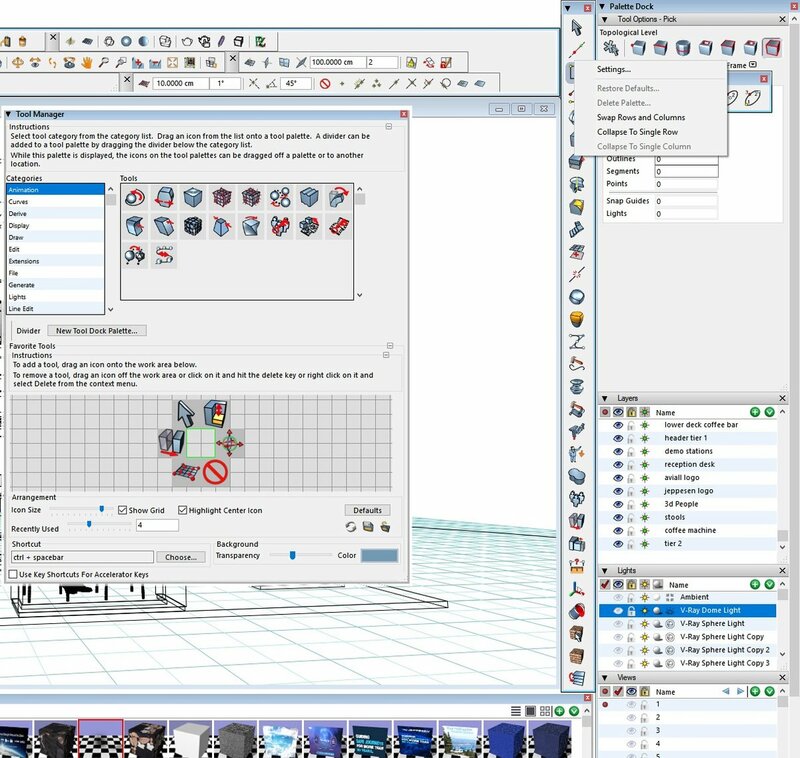 Then you can Right Click on the Modeling Tool Bar on one of the Icons. Select Swap Rows and Columns or Collapse to a Single Row, depending on what you are looking to achieve. The FormZ interface is fairly flexible, almost to a fault. Using the Tool Manager, you can also add and remove tools in the toolbars themselves. In my example you can see I have a single vertical tool bar on the right and have added the Edit Texture, Map Texture, and Set Layer tool to be always visible since I am constantly using those and it's annoying to have to go inside the Attributes tool for them. You have to be mindful when setting this up so that it works correctly on restart. If you keep it simple and save your Workspace ONLY ONE TIME on exit, then restart FormZ and go to Workspace Manager and UNCHECK 'Save Between Sessions'. Also in the Workspace Manager you should Export your new workspace somewhere for future use in case you need to recreate it because your FormZ preferences folder got corrupted and you had to rebuild it. That should help you preserve whatever Interface changes you make, and always be accessible, even transportable to other computers.